LED grow lights have revolutionized the way that people grow indoors like no other advancement ever has in the past. While there are still people that use fluorescent tubes, HID or HPS systems, or Plasma, those that want the highest yield and most efficient grow possible there is no denying the fact that LED grow lights are the way to go. Choosing between all of the different options can leave people lost in the weeds, but there are fortunately companies like Hydro Grow LED that have put in the effort to make near perfect lamps like the Extreme 336X-PRO LED Grow Light. 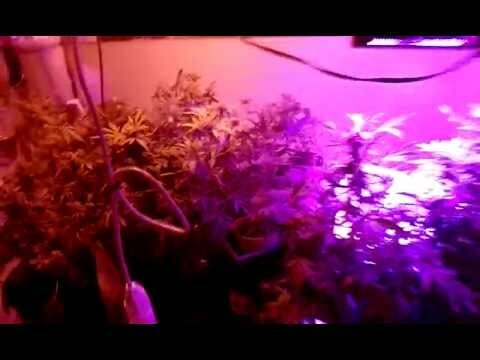 As with any Hydro Grow LED lamp, there are simply too many good things to say about it. That might seem like hyperbole, but once we go through an in depth look you will be able to see exactly why that is the case. With 336 3w LED diodes from top manufacturers, this grow light has the power to blast your plants with just the right kind of light. That light comes in the form of six different bands, which replicates the kind of light that your plants would be receiving in the natural world. Many LED lights fall short in this category, due to the fact that they provide only red and blue light, which are technically what your plants need, but they aren’t all that they need for a balanced and healthy life. The first thing that many people point to when it comes to LED grow light benefits is the incredible levels of efficiency that they operate at. A 1,000 watt HID system can surely provide you plants with powerful, almost blinding light, but it doesn’t come easy. An HID system will waste a great deal of power in the process due to the lack of efficiency in producing that light, although a 500 watt LED light such as this one can provide the same amount of light. That 50% reduction in power draw also means that you will spend half as much money on electrical bills. Why would you spend all of your money on power bills when it means that you won’t make any money off of the harvest? Hydro Grow LED is one of the most trusted names in the grow industry. They take pride in the kinds of products that they provide and they have spent countless years growing and researching in an effort to find out what works and what doesn’t in the world of indoor growing. In fact, they have released statistics on week to week growth for a variety of plants that have been grown under their lights. Not many companies are willing to give out independent test results on their LED lights, but Hydro Grow LED stands behind everything that they produce and every single claim that they make. That is the mark of a company that you can trust with such a large investment. For indoor grows, there is a reoccurring problem in terms of covering every plant you have with light. This can be problematic with many LED lamps since they don’t have the highest coverage compared to other forms of lighting. This offering from Hydro Grow LED, however, can easily cover 16 square feet of space, which is great for many smaller indoor grows. If you have more space than that, two can easily be chained together to light a larger area without much added hassle. According to Hydro Grow, and independent testing on similar lamps, the Extreme 336X-PRO LED grow light can last for around 50,000 hours, which is more than enough to make it through many grow cycles without ever having to worry about replacing it. For a comparison, T8 fluorescent tubes typically only last around half of that time. What is also important is that LED grow lights will stay just as efficient and just as powerful for that entire length of time, rather than losing power as the months go by. When you spend this much money on a single grow light, it is important that it be built to last. The high quality construction that Hydro Grow LED uses here stands out among the competition and shows how much the company cares about their grow lights. With an integrated heavy duty ratcheting hanging system, you will never worry about the light falling, while the reflectors and casing are just as high quality and built to truly last. In all honesty, there is only one problem that people have come across when using this particular LED grow light, although it applies to almost all of them due to the nature of the technology. The startup cost can be incredibly prohibitive for some people. With a high price, it can seem like something that costs more than it is worth. In truth, however, it is simply not a black and white issue when you look at the overall picture. Whereas an HID system can be setup for just a few hundred dollars, this is much more, there is no denying that. When taking a look at the long term savings and the enhanced harvests that you’ll have, this LED grow light more than pays for itself in just a short amount of time. When it comes to commercial LED Grow lights, it is almost impossible to match the kinds of things that Hydro Grow LED has accomplished. The Extreme 336X-PRO LED Grow Light is certainly proof that they have earned every ounce of the reputation that they have in the growing industry, so you would be making a terrible mistake to go anywhere else for lighting. This lamp will serve you well harvest after harvest, giving you the greatest crops of your life. Check it out today! You’ll regret it if you pass up an opportunity like this for extreme growing improvements. Here’s is a letter from the company, and they are NOT warranting anything past the 3 year mark . They admit they were a faulty product right out of china. All of our previous generations were made in China where we had little control over the finished quality of the end product. Many times suppliers would switch out components on us without our approval, nor would they inform us of the changes. It caused a lot of issues like recurring power supply failures, LED board failures, and blue LEDs burning out as you have noticed. The entire reason we went to US manufacturing was to eliminate these issues once and for all. I’m please to inform you that our latest lights are many times more reliable than their predecessors. Our LED boards and power supplies now have less than a 1 in 500 failure rate. We have used the manufacturers for these components since 2015 for the LEDs (X2 and SOL) and 2013 for the power supplies (SOL), thus we have long-term reliability data on their parts/quality. Your X2 unit had a different manufacturer who used inferior power supplies and often put the wrong blue diodes in our lights, causing mass burn-outs. We stopped doing business with them in 2015. We will happily ship you the parts you need to fix your 336X-PRO. I hope you will not be discouraged from our latest generation, as we stand behind it with a 5-year warranty and parts are always on hand here in the US since we now manufacture here. To top it off Hydrogrow said they would send replacement blue diodes for the faulty ones , well that was a month ago. I have been trying to repair this 336x for 5 months. They are a one woman show , and they do not answer the phone or emails. DO not buy or attempt to give them money for the new generation as they do not ship them out. I have been waiting for 3 weeks ( they have my 1750.00 ) and just requested a refund. Just to think I used to be an affiliate for them.